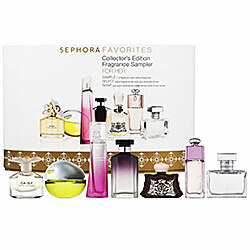 I love these gift ideas from Sephora. 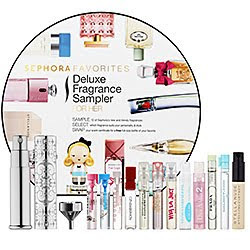 The kit includes a voucher that you bring into a Sephora stores after you decide which one is right for you and trade it in for a full-sized bottle! It is a great way to try out a new scent to make sure it the one you want. All this comes with a pretty price tag of $50! The little boy in the glasses (beginning at 3:03) is the funniest/cutest thing I have seen all day! Husband has told me that I am not supposed to randomly exclaim, "It's almost Christmas!" until after Thanksgiving, but no one has told that to the local malls. 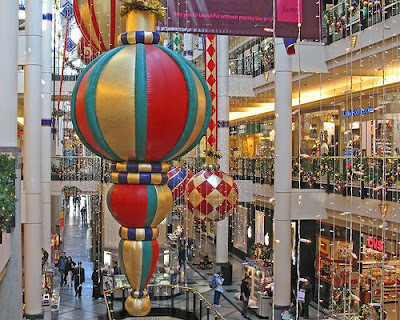 They are already filled with Christmas decorations and a festive spirit. Despite the fact that I buy most of my gifts online, I love going shopping this time of year. The holiday energy puts me in such a good mood. I love this time of year. Shopping for people I love, buying new coats, wearing comfy sweaters, drinking Gingerbread Spice Holiday Tea by Celestial Seasonings (I need to remember to stock up so I can continue to drink this all year around!) and spending time with friends and family. And the sales - don't forget the sales! It doesn't hurt that my birthday is in early December. I get a birthday month instead of just one day because Husband spoils me. How could I not love the holiday season when celebrating my birth is part of the festivities? It's almost Christmas! Merry Thanksgiving! I read this on FMLife last night and I laughed so hard, I cried. I couldn't even read it loud to Husband without bursting into giggles. I just stood on the steps trying to get through it, tears running down my face. Although I was unable to share the entire passage with him, he got the idea. Or at least he acted like he did, so I would stop talking/laughing uncontrollably and he could get back to watching the football game. I am not sure what that says about me as a person, but I am pretty sure it is hilarious. If that didn't make you as happy as it made me, there are more where that came from at FMLife.